Applications to access documents held by Queensland government agencies1 can be made under the Right to Information Act 2009 (RTI Act)2. Increasingly, the scope of these applications encompass social media platforms, such as Facebook and Twitter, agency documents held in personal webmail accounts, text messages sent using agency-issued devices and work-related text messages sent using personal devices. Applications for access can only be made for documents of an agency or documents of a Minister. A document of an agency is a document in the physical possession or legal control of an agency. A document of a Minister is a document that is not a document of an agency, is in the physical possession or legal control of the Minister, and relates to the affairs of an agency. It includes a document the Minister is entitled to access and documents in the possession or control of the Minister's staff or consultants. For more information refer to Documents of an agency and Documents of a Minister. Where the account is operated by the holder of an agency office, such as a local government councillor, in their official capacity. Where the social media account is operated by the agency as an official account. interactions on the account consistent with carrying out their role in the agency. If it is determined that the account is being operated in an official capacity, the contents of the account will be documents of the agency. Section 53 of the RTI Act allows an agency to refuse access to a document if the applicant can reasonably access it under other arrangements made by an agency. In some circumstances, if an application captures publicly available posts, tweets, photos or other material available on agency social media accounts, section 53 may apply. However, consideration should be given to the ease with which specific posts etc containing the information can be located and to the applicant's circumstances; some applicants may not have the ability or equipment to access agency social media. For more information, refer to Refuse access to a document – other access available. Emails that have been sent or received in an official capacity or to conduct official business will be documents of an agency under the RTI Act, even if they are stored in an officer's private email account.8 This can be a webmail account, such as a Gmail or Hotmail account, or downloaded through a home email program from an account with no web interface. Where agency policies specifically allow the use of private email accounts for agency business, for example where officers are travelling or working from home, decision makers may need to consider accounting for this in their search processes. An officer's private email address is not routine personal work information and must be dealt with in the same way as other personal information under the RTI Act. This information would rarely be in the public interest to release. When stored on an agency owned device, regardless of the content of the message. In the former case, it will be necessary to carefully consider the context of any messages to determine if they are documents of an agency under the RTI Act. If so, steps will need to be taken to capture them, so they can be processed and, if appropriate, access given. 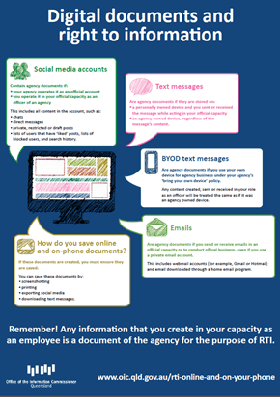 Where an agency has a bring your own device policy, allowing agency officers to use their own devices for agency business, it will be particularly important to ensure those devices are captured in any search requests. If an officer of the agency sends, receives, and stores text messages on a device owned by the agency, the contents of the messages are irrelevant; the fact that the agency owns the device will make them documents under the RTI Act. However, an assessment of the content will be necessary to determine if the documents are within the scope of an application and if they should be released. Where there are too many text messages to manually search, it may be necessary to download the text messages from the device before they can be searched, to determine which text messages are in scope. Capturing text messages is discussed below. Agencies should consider including information in any BYOD or similar policies about officers' public records and RTI Act obligations. Any policies that allow personal use of agency devices should advise officers that information stored on the device, including personal text messages and documents, could potentially become subject to an RTI application. On most smart phones, text messages are grouped together based on the participants in the conversation. These groups are sometimes referred to as 'text chains'. When considering text messages as part of an access application, each individual text message is the document, not the text chain. Unlike email chains, in which an email is appended to the one before, text messages are simply displayed together in groups; they are not attached to each other. These groups are analogous to folders on a hard drive, grouping the individual text messages together for convenience. On most devices, you can deal with each text individually (delete, forward, save etc) without impacting the rest of the texts in the group. When dealing with text messages, decision makers only need to consider the specific text messages within scope of the application and not the entire 'text chain'11. Processing and giving access to social media documents and text messages can present unique challenges. However, if agencies create these documents, they have an obligation to take the steps necessary to ensure people can exercise their right of access. This may include acquiring specific software to assist in the process. Taking screenshots of a webpage displaying a social media account or of a text message can be an effective way of capturing them for an access application. Screenshots of text messages are saved as photos on the device, which can then be downloaded for processing. Screenshots of webpages can be printed, pasted into a Word document, or dealt with however the agency prefers. Webpages displaying social media accounts can be printed, either to paper or directly to PDF. An officer with emails in their private account can print them, to paper or to PDF, although forwarding them to an agency email account may be more efficient. The contents of a social media account can be exported using different methods. These include paid third party services, tools built into the platform, and interfacing directly with the application programming interface (API). Where an agency has to deal with a large number of text messages, making screenshots impractical, it may need to explore acquiring software to capture, search, and process them. There are a number of third party programs available which can interface with different devices and operating systems. Decision makers should consult with their IT units to determine suitable programs, but should ensure any program allows for text-based searching of messages and exporting into other formats, particularly PDF. This will allow key-word searching for text messages within scope and for in-scope text messages to be processed easily using standard redaction tools. 1 References to an agency in this guideline include a Minister. 2 And the Information Privacy Act 2009. 5 When considering Ministers and ministerial staff and advisers, and determining if they are documents of a Minister, there is the additional requirement that the content must relate to the affairs of an agency. 7 Determining if this content is a document of a Minister will require an assessment of both the contents and the role of the operator of the account. 8 This also applies to Ministers and ministerial staff and advisers, with the additional requirement that to be documents of a Minister the contents must relate to the affairs of the agency. 10 Refer to guidance issued by the State Archivist: https://www.forgov.qld.gov.au/public-records-private-accounts, however note that the range of documents which will be public records is narrower than the range of documents which can be documents under the RTI Act. 11 Unless the application is for all text messages between Officer X and Officer Y, in which case the entire text chain would be in scope.